Things tightened up at the top and the bottom of the Bundesliga on Matchday 11, with FC Bayern München dropping their first points of the season and Borussia Dortmund taking full advantage. Allow bundesliga.com to keep you up to date with all the latest Bundesliga news after another defining weekend of Bundesliga action. That's all from us from Matchday 11. Be sure to join us again as we build up to Matchday 12 which features the mouthwatering, bone-juddering derbies on the Rhine and the Ruhr. In-form Borussia Mönchengladbach are preparing for tomorrow's Champions League clash with Juventus. ...in Eindhoven ahead of their Champions League clash with PSV on Tuesday. It is the week leading up to the Revierderby and Schalke appear to be drumming up support for Sunday's trip to Dortmund. Lucien Favre guided Borussia Mönchengladbach to third in the Bundesliga and a place in the Champions League last season, and he will not be forgotten by the Foals, especially not on his birthday! If you missed any of the action this weekend, just click on the Tweet below to ensure you still know all of the essential information from Matchday 11. Champions League football also for Bayern this week, with Arsenal paying the Allianz Arena a visit. It's not misty in Munich today, as the Bavarians look to bounce straight back from dropping their first points in the Bundesliga this season. Good news for VfB Stuttgart the day after their morale-boosting win over SV Darmstadt 08 - Mitchell Langerak is back in training, continuing his recovery from a knee injury. SV Werder Bremen are wishing their fans a nice start to the week, posting this picture of a very autumnal Weser Stadion. It is another week of UEFA Champions League and UEFA Europa League action, with VfL Wolfsburg the first on their travels, albeit for a relatively short trip to Eindhoven. They are heading to Holland already to prepare for Tuesday night's clash with PSV. Darmstadt not only have a 2-0 defeat to Stuttgart tempering their mood, they also have to try to lift their spirits despite some grey and foggy weather in Germany this morning. On Sunday afternoon, the draw for the last 16 of the DFB Cup took place, with three all-Bundesliga ties coming out of the hat. Click on the Tweet below to be directed to our overview of the German domestic cup competition. That's it for today! Hannover 96 wrapped up the weekend with a 2-1 victory away to Hamburger SV. We'll be back tomorrow with all the reaction from Matchday 11. Make sure you tune in! And here are the teams for today's late game between northern rivals Hamburg and Hannover. Hats off to Stuttgart's skipper, who is making his 300th appearance this afternoon. Don't forget to follow the action live on Bundesliga radio! The line-ups are in for Stuttgart vs Darmstadt. Serey Die and Christian Gentner return for the Swabians at the Mercedes-Benz Arena this afternoon. It was not the prettiest of games, but new Hoffenheim head coach Huub Stevens will have been happy to leave Cologne with a share of the spoils on Saturday afternoon. The point lifts the Sinsheimers above Baden-Württemberg rivals Stuttgart, but they will drop back into the bottom two if the Swabians avoid defeat against Darmstadt. After Gladbach's sixth straight Bundesliga win at the Olympiastadion on Saturday, Foals skipper Granit Xhaka has spoken about his newfound self-confidence and Tuesday's Champions League clash with the Italian champions. Click here for the interview! Schalke starlet Leroy Sane netted his fourth league goal of the season to earn the Royal Blues a share of the spoils against Ingolstadt. We'll be bringing you an interview with the German U19 international later today, so keep your eyes peeled for that! Everything you need to know about yesterday's game at the WWK Arena really... Want to find out what hat-trick hero Yoshinori Muto made of it all? Click here! Borussia Dortmund have been given the day off on the back of their 3-1 victory over Bremen on Saturday. Thomas Tuchel's players will be back on Tuesday, though, to prepare for their upcoming UEFA Europa League tie against Qäbälä. That's all folks - for now! The action may be over for Saturday but there is plenty more in store on Sunday afternoon. Both Stuttgart and Hannover are in need of victories to help them pull away from the drop zone, but they face resilient opponents in Darmstadt and Hamburg respectively. Drama and goals are guaranteed, so make sure you check back with us tomorrow. Until then, gute Nacht! A goal from supersub Julian Draxler earned Wolfsburg a 2-1 win at home to Leverkusen, with the victory taking them above Schalke in the table. Nicklas Bendtner had opened the scoring at the Volkswagen Arena, before Javier Hernandez equalised with a well-taken header. Click here for our full report and here to see our XXL Matchday 11 picture gallery. Don't forget you can listen to Leverkusen's trip to Wolfsburg live on Bundesliga radio right here. Alternatively, keep tabs on events at the Volkswagen Arena on the live match ticker. Take your pick! And breathe! To recap the afternoon's action, Borussia Mönchengladbach moved into the top four for the first time this season following an emphatic 4-1 win at Hertha Berlin. Borussia Dortmund also picked up three points on the road, downing SV Werder Bremen 3-1. The other big story of the day so far, meanwhile, comes from the WWK Arena, where Yoshinori Muto scored a sensational hat-trick to rescue 1. FSV Mainz 05 a point in a thrilling 3-3 draw with FC Augsburg. Elsewhere, FC Ingolstadt held FC Schalke 04 to a 1-1 draw and Huub Stevens' debut in the TSG 1899 Hoffenheim hot seat ended goalless at 1. FC Köln. Kick-off is upon us in this afternoon's early games, so our rolling bulletins here we'll be on ice until after the final whistle. Never fear, however, as you can stay up-to-date with all the latest from around the grounds on our live ticker and on the free Bundesliga app. Enjoy! Less than an hour and a half to go until today's 15:30CET/14:30GMT kick-offs get underway! Huub Stevens takes charge of Hoffenheim for the first time at the RheinEnergieStadion this afternoon. Like Augsburg, the Sinsheimers are in deep trouble at the foot of the table and could do with a morale-boosting victory. Remember to tune in to Werder Bremen vs Borussia Dortmund live on Bundesliga radio today (wherever you are!). Hertha's Olympiastadion looking resplendent ahead of the Old Lady's meeting with Gladbach. For more of bundesliga.com's exclusive Julian Brandt interview ahead of today's game between Wolfsburg and Leverkusen, click here! Cameroonian brothers Joel and Marvin Matip face each other for the first time in there careers at the Veltins-Arena this afternoon. 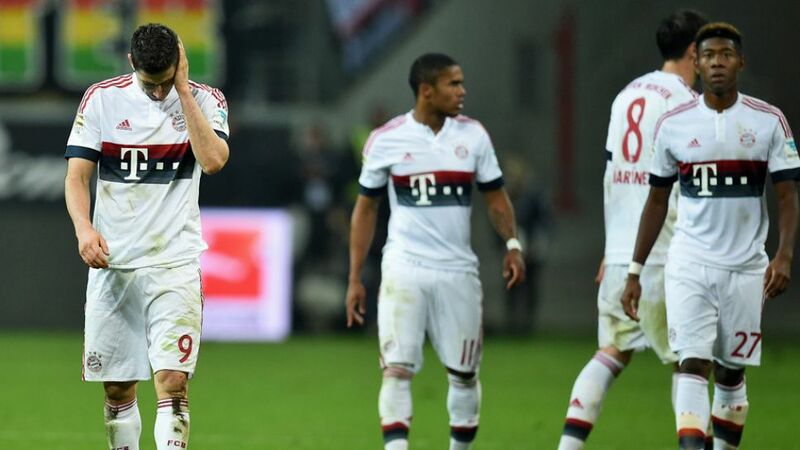 Lukas Hradecky and Co became the first team to take points of FC Bayern München in the league on Friday night, as Eintracht Frankfurt held the runaway leaders to a goalless draw at the Commerzbank Arena. Head over here to find out what the players and coaches made of the stalemate.